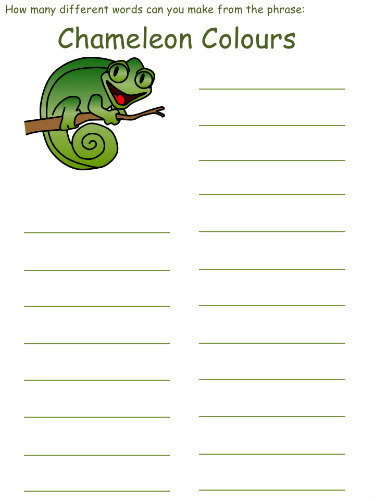 Print out the word mining puzzle and make as many words as you can from the chameleon themed phrase "Chameleon Colours." This is good spelling practice for young children (and a challenge for adults too)! Some people find it useful to rearrange the letters they have available in alphabetical order or grouped by consonants and vowels before they start mining. Words that require a capital letter are not allowed (names like David or Sally). Words that are pluralized simply by adding an "s" are not allowed (cats, dogs, owls) though their singular is allowed (cat, dog, owl). Words that require punctuation are not allowed (ex: can't, don't). To make word mining more challenging, you can also disallow 1, 2 and 3 letter words. However, if you're doing this with younger children I recommend allowing them to form words with as many letters as they like.